Universities around Queensland are moving towards a more sustainable future, as the younger section of the population increases the pressure to go green. While it has become commonplace to see the state’s universities outlining a general sustainability plan, certain campuses are going above and beyond to improve their environmental footprint. 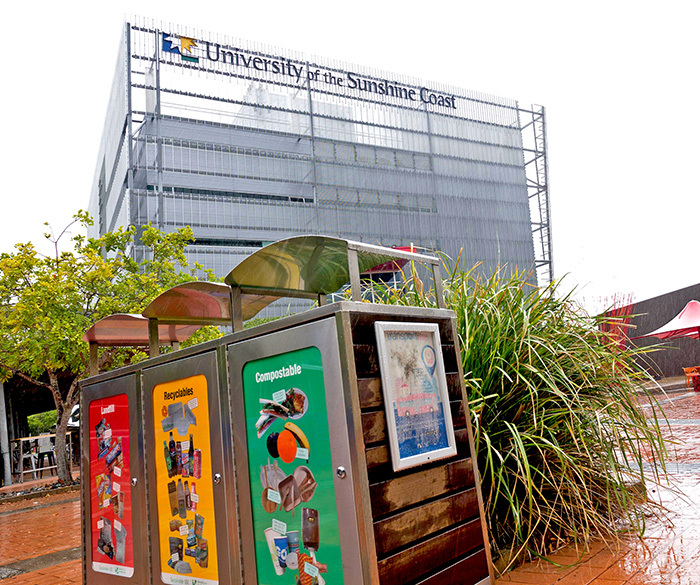 The University of the Sunshine Coast (USC) has built a strong image of eco-friendliness for itself through both its teachings and its practice. USC sustainability researcher Professor Tim Smith said sustainability had always been a key point of reference to the university. “Sustainability remains a core value of USC, which has been translated into numerous teaching and learning, research, engagement and facility initiatives,” Professor Smith said. “Environmental management and sustainability were planned from the conception of the university and incorporated into the campus master plan, which serves to guide all new works and ongoing operational management,” he said. According to Professor Smith, the USC actively participates in many sustainable programs that are unlike those seen at other universities around the state. One of the university’s key programs is the compensatory habitat program, which is a 15-hectare block of land at the Sunshine Coast campus used to protect native vegetation. The university relocated vegetation from the region’s coast to the empty block of land at USC, after the land the plants originated from was cleared for a housing estate development. “The site management incorporates an active fire management to enable several threatened plants and ecological communities to regenerate, and hence maintain long term sustainability, preventing their degradation,” Mr Smith said. This fire management plan involves controlled burns of the compensatory habitat to reduce the fuel available for potential wildfires, which has the benefit of promoting new growth and a healthy environment for the plants on site. Professor Smith said USC had also implemented measures to protect kangaroos in the region by using virtual fences, which work by emitting sound and light stimulants along roadsides to deter animals from crossing the path of oncoming traffic. “USC is collaborating with Sunshine Coast Council on a virtual fence trial on Sippy Downs Drive to research the effectiveness of this new technology in reducing death by vehicle collision,” he said. Professor Smith said the design and implementation of the virtual fence was a team effort, which began with an 18-month long PhD project by a USC student, and underwent thorough planning and development over a three-year period. “[It] has become a reality after two to three years of planning and cooperation with Sunshine Coast Council and Wildlife Safety Solutions, who have pioneered the product elsewhere in Australia,” he said. The university also has a strong focus on water, soil and energy conservation. “Water quality of storm water and runoff is protected as all water is collected in the university lakes and reused for air-conditioning, irrigation and topping up the Olympic sized pool,” Mr Smith said. Professor Smith said the USC was supporting an adaptable sustainability movement that ensured on-going success by implementing a research centre focused purely on sustainability. It is not just the Sunshine Coast getting on board the sustainability train; universities in Brisbane are also backing the movement. Like USC, Griffith University has also incorporated a sustainability plan into its overarching syllabus, according to the university’s sustainability project officer, Kay Ollett. “Sustainability is one of five high level goals in the Griffith Strategic Plan 2018-2019 that set the direction for the university,” Ms Ollett said. Sustainability Week, which has just wrapped up for another year, is one of Griffith University’s main events highlighting the value of living an eco-friendly lifestyle. “Sustainability Week was first held in 2014, with the aim to create opportunities for staff and students and community members to be involved with Griffith’s sustainability commitment,” Ms Ollett said. The university undertook a number of activities as part of Sustainability Week, including papercut art workshops, book exchanges, and markets selling succulents and ethically sourced jewellery. Sustainability Week also promoted awareness of single use coffee cup waste, by inviting university students and staff members to place their single-use coffee cups in collection tubes located around the campuses. 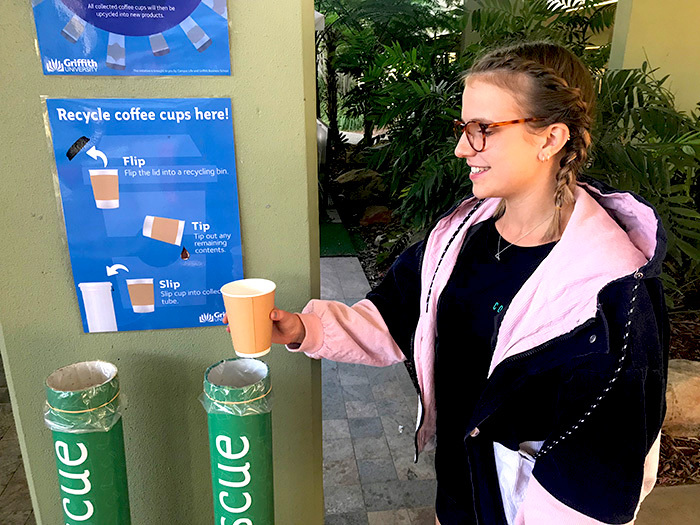 The university partnered with Simply Cups (Australia’s first dedicated coffee cup recycling program), who provided the cup collection tubes. According to Simply Cups, the company recycles and upcycles takeaway cups by combining them with other plastic materials that would otherwise go to landfill, such as grain bags, straws and lids, “to create a resin suitable to upcycle into new products such as bench seats, kerbing and car stops”. “This year, one of the activities was to promote the new coffee cup recycling program that has been implemented on all campuses,” Ms Ollett said. The program aimed to encourage coffee drinkers to use reusable cups, by collecting single use coffee cups and displaying them en masse during Sustainability Week to show just how much waste disposable coffee cups produced. Ms Ollett said the university’s efforts towards greater sustainability were not limited to Sustainability Week. She said the university had installed electronic vehicle charging stations and had upgraded its company vehicles to hybrid-run alternatives, which promoted greener transport methods. “Since July 2016, the university has embarked on a strategy to replace all of its conventional petrol cars in its fleet with hybrid vehicles by the end of 2018,” she said. Ms Ollett said the actions toward a sustainable future were not new initiatives. “The Griffith University Sustainability Policy was approved by the University Council on the third of October 2011, and Sustainability Plans have been in place since 2013, incorporating economic, environmental and corporate social responsibility in our teaching programs, research activities, community engagement and operational practices,” she said. The University of Queensland (UQ) is also feeling pressure to advance their sustainability commitment. UQ environment and sustainability program manager Helena Malawkin said the increasing pressure from population growth, the rising costs of running the campuses and a push from students had all influenced the university’s sustainability plan. “Sustainability is important to the University of Queensland because it is a large facility, and without efficiency of operations, risk and environmental management, the university would become overwhelmed with increasing utility costs,” Ms Malawkin said. Ms Malawkin said the sustainability plan was an ever-changing point of reference for staff and students, developing alongside the values and beliefs of the UQ community. “The planning is continuous with tweaks and improvements to delivery taking place regularly,” she said. Thanks to a huge amount of cooperation from universities in the South East, the movement towards a sustainable, cleaner, greener future is well underway.